Advance Auto Parts in Goodlettsville, Tennessee. 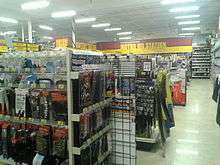 Advance Auto Parts, is headquartered in Roanoke, Virginia and Raleigh, North Carolina, and is now the largest retailer of automotive replacement parts and accessories in the United States by store count after acquiring General Parts Incorporated in October 2013. AAP was founded in 1932 and had 2015 sales of approximately $9.74 billion. The combined enterprise of AAP (including Carquest branded stores) operates over 5,200 company-owned and 1,300 independently owned stores covering every U.S. state, the Virgin Islands, Puerto Rico, and Canada with more than 70,000 employees. 2006-2010 Chevrolet HHR used as the fleet vehicle of the company. In April 1932, Arthur Taubman purchased from Pep Boys, the Advance Stores, with two stores in Roanoke, Virginia and one in Lynchburg, Virginia. 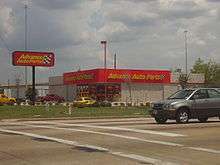 The first major expansion of Advance Auto Parts was in 1998 when the company acquired the remaining operations of Western Auto, an auto parts and general store retailer. Most of the Western Auto operations had been taken over by Sears, Roebuck and Co. in 1987. In April 2001, Advance Auto Parts acquired Carport Auto Parts, a regional retail chain with 29 stores in Alabama and Mississippi. On November 28, Advance acquired 671 Discount Auto Parts, Inc., a regional auto parts chain in Florida, Alabama, Georgia, South Carolina, and Louisiana. Upon completion of this merger, Advance Auto Parts became a publicly traded company, listed as a common stock on the New York Stock Exchange under the symbol AAP. The year ended with 2,484 stores in 38 states. In July 2002, Advance Auto Parts received bankruptcy court approval to acquire 57 Trak Auto stores in northern Virginia, Washington, DC, and eastern Maryland. In September 2006, Advance Auto Parts (NYSE:AAP) announced an agreement with ADMMicro, a VA-based company, to retrofit certain existing stores and equip new stores with an Energy Management System (EMS). From 2010 to 2013, Advance Auto Parts was a title sponsor of Monster Jam and sponsored a truck on the circuit called the Advance Auto Parts Grinder. In December 2012, Advance Auto Parts acquired BWP Distributors, a Carquest franchise for the New England region that included the transfer of 124 company owned retail locations plus 2 distribution centers. The responsibility for 92 independently owned location that were service by BWP were transferred to General Parts, Inc., the largest Carquest franchise along with one distribution center for servicing those locations. On October 16, 2013, Advance Auto Parts entered into a definitive agreement to acquire General Parts International, Inc. (GPI), a leading privately held distributor and supplier of original equipment and aftermarket replacement products for commercial markets operating under the CARQUEST and WORLDPAC brands. The deal created the largest automotive aftermarket parts provider in North America. General Parts International, with corporate headquarters in Raleigh, NC, has seen a significant rise in personnel since being acquired by Advance. Most of these added jobs are personnel from Roanoke, Minnesota or between the now redundant GPI positions being transferred to Raleigh. In 2014 Advance Auto Parts began a Loyalty Program for "Do-It-Yourself" retail customers, named SpeedPerks. By enrolling in the loyalty program, the member will receive discounts off of purchases without the need of a card or point system. When a customer spends $30 in store before tax, a $5 off coupon will be sent in their email, for a $100 purchase before tax a $20 off coupon will be emailed to the member. On September 30, 2015, Starboard Value LP, an activist investment firm disclosed a 3.7 percent stake in Advance Auto Parts. Through a letter to Chief Executive Darren Jackson and a keynote presentation published on Starboard's website, Starboard Values believes that Advance Auto Parts shares have the potential to reach $350 each if the company takes steps to improve profit margins. The presentation also stated that "Advance Auto Parts has substantially underperformed compared to peers on almost any measure, including operating margins, revenue growth, and total shareholder return." Roanoke, Virginia-based Advance Auto's sales have missed market expectations in four of the past six quarters. Starboard Value LP was behind the ouster of the entire board of restaurant operator Darden Restaurants Inc last year, owners of the Red Lobster/Olive Garden restaurants. Under market pressure in November 2015, Darren Jackson elected to resign his position as CEO effective January 2, 2016. On April 4, 2016, Advance announced Frito-Lay North America CEO Tom Greco would succeed Jackson as CEO and 2016 Q3 results beat market expectations. Advance Auto Parts is the largest automotive aftermarket retailer in the United States based on sales and store count. The company premiered on the Fortune 500 list of companies in 2003 at No. 466 and has remained on the list since that time. As of June 2014, it was ranked at No. 1,412 on the Forbes magazine "World's Biggest Public Companies" list. Advance has received recognition for charitable contributions. The company has been named an "elite partner" for its fundraising for the Juvenile Diabetes Research Foundation (JDRF), having donated more than $42 million since 1994. Advance acts as an aggregator for the largest portion of the donations for JDRF, collecting monies from both walk-in customers and commercial business through the sale of paper sneakers, that once purchased by the customer are displayed on the store windows. ↑ "About Us - History of Advance Auto Parts". Advance Auto Parts. Retrieved February 27, 2012. ↑ "Aftermarket Business - January 2010". Retrieved 16 March 2016. ↑ "Advance Auto Parts Announces Acquisition of Autopart International, Inc.; New Store Count Now Expected to Be 220-230 Stores In 2005". Business Wire. September 15, 2005. ↑ "Advance Auto Parts Acquires Autopart International". aftermarketNews. September 15, 2005. 1 2 Snipes, Cameron (December 16, 2013). "Year in Review: Sloan sells Raleigh's General Parts for $2 billion". Triangle Business Journals. 1 2 Jaisinghani, Sagarika (October 16, 2013). "Advance Auto expands repair shop business with $2 billion buy". Reuters. ↑ "Advance Auto Parts Corporate Site - Service Is Our Best Part". AdvanceAutoParts.com. Retrieved 2016-04-18. ↑ "Sears Is Selling Its Western Auto Supply Unit". Los Angeles Times. August 18, 1998. ↑ "Carport will be sold to Advance Auto Parts". Tuscaloosa News. March 16, 2001. p. B7. ↑ "Advance Auto Parts to Acquire Carport Auto Parts Stores". PRNewswire. March 15, 2001. ↑ "Discount Auto May Lose 70 Stores; Advance Auto may close the stores as part of its merger". Lakeland Ledger. January 23, 2002. p. E1. ↑ "Discount Auto shareholders approve Advance merger". Tampa Bay Business Journal. November 30, 2001. ↑ "Advance Auto Buys 55 Stores". Roanoke Times. July 24, 2002. Retrieved February 27, 2012. (subscription required (help)). ↑ "Advance Auto Parts to Acquire Trak Auto Parts Stores in Washington, D.C., Northern Virginia, and Eastern Maryland Markets" (Press release). Advance Auto Parts. July 23, 2002. Retrieved February 27, 2012. ↑ "ADMMicro Installing Energy Saving System in Advance Auto Parts Stores" (Press release). ADMMicro. September 13, 2006. ↑ "Advance Auto Parts Announces Closing of Acquisition of BWP Distributors". Reuters. December 31, 2012. ↑ "Advance Auto Parts Announces Acquisition Of BWP Distributors". AftermarketNews. December 19, 2012. ↑ "Auto Parts Store". Retrieved 16 March 2016. ↑ WRAL. "Advance Auto Parts to create 600 jobs in Raleigh". WRAL.com. Retrieved 16 March 2016. 1 2 3 Reuters Editorial (30 September 2015). "Starboard takes stake in Advance Auto, urges changes". Reuters. Retrieved 16 March 2016. ↑ Christopher Boyd and Lisa Baertlein (10 October 2014). "Darden activist ousts Olive Garden owner's full board". Reuters. Retrieved 16 March 2016. ↑ Amanda Hoyle (12 November 2015). "Activist investor Starboard Value shakes up leadership at Advance Auto Parts, CEO Darren Jackson to step down - Triangle Business Journal". Triangle Business Journal. Retrieved 16 March 2016. ↑ Research, Zacks Investment. "Advance Auto Parts (AAP) Beats Earnings & Revenues in Q3". Zacks Investment Research. Retrieved 2016-12-02. ↑ "Our Corporate Partners". www2.jdrf.org. JDRF. Retrieved 19 June 2016. ↑ root (6 May 2014). "Aggregation". Investopedia. Retrieved 16 March 2016. Wikimedia Commons has media related to Advance Auto Parts.